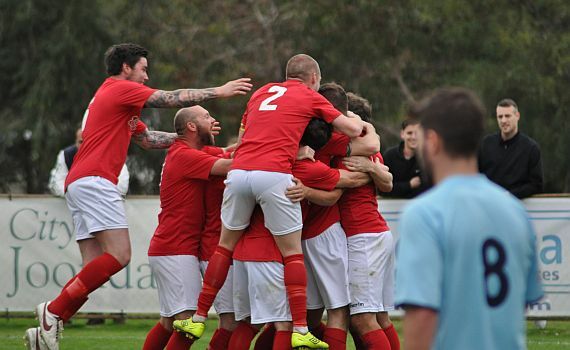 ECU Joondalup have taken out bragging rights after beating Sorrento 3-0 in the Northern derby at the ECU Joondalup Stadium. The visitors went close to the opener after only four minutes, a corner wasn’t dealt with by ECU and the ball fell to Brad McDonald on the edge of the penalty area, but his shot was superbly saved low to his left by Lewis Italiano. Gordon Smith had a perfect opportunity to level on 18 minutes, when he was sent clear by new signing Kevin Moon, he rounded the keeper but took the ball too wide and the chance was gone. But 11 minutes into the second half the home side found the break through. Moon and Gordon Smith combined to free Amphlett, who finished well past James Morgan. It was 2-0 moments later, Andy Higgins’ corner picked out the unmarked Gordon Smith who headed home from close-range. Sorrento were struggling in the final third, but should have pulled one back on 77 minutes. Steven McDonald’s header back across goal found Sean Canham, but with the goal at his mercy the big striker blazed over. With Sorrento pressing forward ECU were finding holes at the back. Gordon Smith volleyed over, before Shane Pickering fired inches wide from Paddy Doyle’s cross. Then in stoppage time ECU added a third, when Steven McDonald brought down Gordon Smith, and the Scottish striker picked himself up to score from the resulting penalty.